I was looking for a waterpick and came across this. Seems like a good deal to me. It has some good reviews everywhere, and it costs half of the other branded ones. The Rio dental water jet is an oral irrigator that flushes out food debris and the bacteria responsible for plaque, held between the teeth and below the gum line. High-powered pulsating water penetrates much deeper in between the teeth and below the gum line than can be achieved by either brushing or flossing. With regular use as part of your normal tooth care regime, it will help to prevent gum disease, improve oral hygiene and provide a stimulating massage to the gums. Could this be used instead of brushing? I've read the reviews and I'm interested. Could this be used instead of brushing? I've read the reviews and I'm … Could this be used instead of brushing? I've read the reviews and I'm interested. 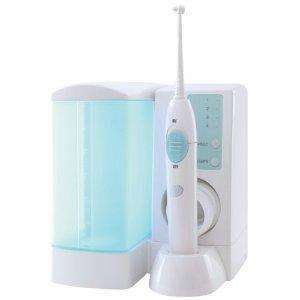 "Oral Irrigators are small water-jet devices that you can use at home. They shoot rapid pulses of water in a fine jet, which can be aimed at the small spaces between the teeth, under bridges and around dental implants. THEY DO WORK. Research proves that they ALL remove MORE BACTERIA from your teeth than brushing and flossing alone. It's a bit like having a car jet-wash for your teeth! "Whichever water-jet irrigator you choose, remember that it CANNOT replace a brush. Oral irrigators are meant to be used AS WELL AS a brush! So brush first, then go round your teeth again with your oral irrigator." I bought it for GF as she is having dental braces. It comes very handy. According to Camelcamelcamel.com, on 26 Aug this year it was down to £21.85 for a couple of days. Mains powered. Worth noting, if you haven't got a shaver socket in your bathroom. Hot deal all the same. Advice"Oral Irrigators are small water-jet devices that you can use at … Advice"Oral Irrigators are small water-jet devices that you can use at home. They shoot rapid pulses of water in a fine jet, which can be aimed at the small spaces between the teeth, under bridges and around dental implants.THEY DO WORK. Research proves that they ALL remove MORE BACTERIA from your teeth than brushing and flossing alone.It's a bit like having a car jet-wash for your teeth!Howewer: "Whichever water-jet irrigator you choose, remember that it CANNOT replace a brush. Oral irrigators are meant to be used AS WELL AS a brush! So brush first, then go round your teeth again with your oral irrigator. "I bought it for GF as she is having dental braces. It comes very handy. Thanks for the reply. I'll have a think about it. I remember my mother having one of these when I was in my teens and it gave me the nicest clean feeling when I used it.....I have wanted one since I moved out and got married but always assumed they were around £100 or so. Was delighted to have come across this offer on Amazon so have placed an order. I cant stand having to floss and these devices are much better than flossing. Cant wait to get it!